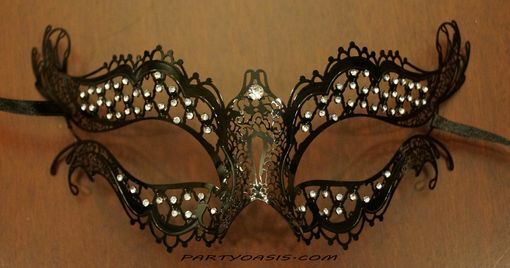 A laser cut metal mask with detailed diamond and swirl patterns, and a high gloss black finish. Small color jewels accent the diamond patterns above the brow, and below the eyes. A larger center jewel above the nose completes this masterpiece. Comes with black satin tie ribbons, and is available with red, blue, purple, pink, silver, or green jewels.